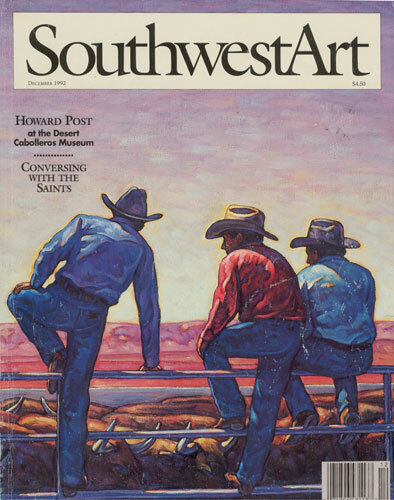 Howard Post's work is on view December 3, 1992, through February 15, 1993, at the Desert Caballeros Western Museum, Wickenburg, AZ. The exhibition is complemented by Wickenburg's annual cowboy poetry gathering, December 3-5. Like a lantern that's losin' its gleam. And time is stealin' my dreams. A real cowboy poet must have been born on a ranch or worked on one. This keeps the art true to its roots and the tales honest...well, at least sincere. At any rate, authenticity is most sought -after. This is also true for Post. He depicts range life with honesty and an attention to detail. But it is not the mythic West established by writers such as Owen Wister, Louis L'Amour and Zane Grey to which Post turns his attentions. Rather, Post demystifies and humanizes a hero whose stardom has resulted in cliché. 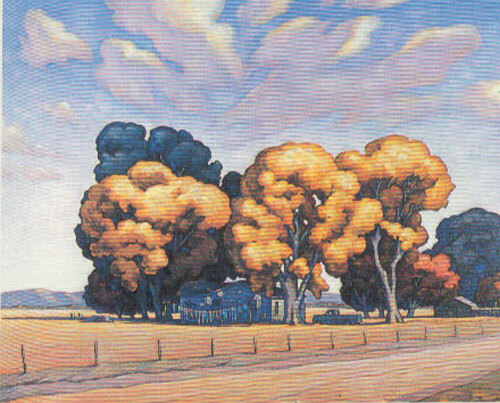 In paintings such as The Bus Stop (see Editor's Perspective), Post acknowledges reality, while giving it his own special brand of poetry. 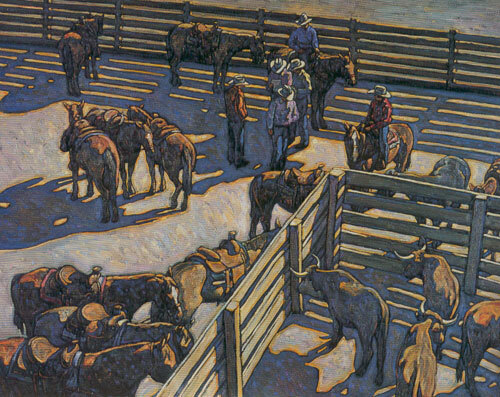 The same sincerity found in cowboy poetry informs the paintings of Howard Post (AZ 1948- Living AZ). Lying on a shelf in his studio is a scrapbook that testifies to his past as a rodeo rider. Professional black-and-white photographs show Post team roping, calf roping and bull riding. In one photo a smooth-faced, shy-looking boy peers out from behind a tall trophy with a caption that reads "Arizona High School Rodeo Champion 1965." Post relishes his years traveling the small-town rodeo circuit with his parents and siblings. But he was happy to give it up for what he terms "a genuine life" with his close-knit family. Watching his former rodeo colleagues rise to fame and then become physically and financially broken has reinforced his determination to succeed in art, where the same rises and falls can take place. Luckily for Post, his renown has been on a steady rise. It was the yellow bulldozer that did it. and playing the cowboy game. My heroes will always be cowboys. Born an artist and raised on a ranch in southern Arizona, Post is attracted to the side of cowboy life that takes place in between those celebratory rides into town and lightning stampedes that Frederic Remington recorded. The quiet, steadfast life of people caring for livestock and the solitary nature of ranching is a recurring theme. 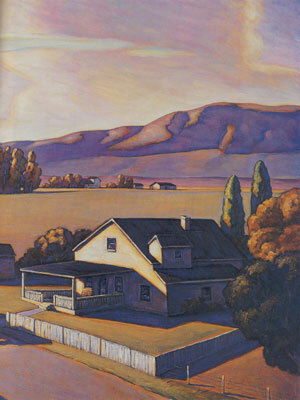 In paintings such as Neighbors, Post emphasizes the isolation through a high point of view that offers a vast vista in which two neighbors share tales. One senses in this work, as in Homestead, that the family ranch, like the family farm, is a dying breed, giving way to corporate conglomerates and housing developments. 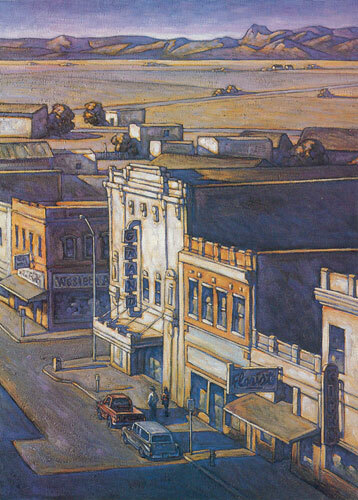 A similar sensation occurs in the city paintings. Though people and cars prove otherwise, there is a feeling of vacancy in Rick's - as if the town were being slowly reduced to the nondescript buildings that appear on its margins. Painting professionally since 1980, Post has always been a design-conscious artist whose bold, graphic style rivets attention upon shapes created by light and shadow. 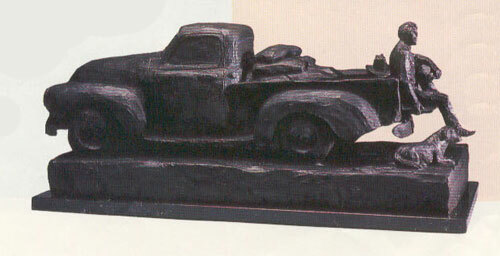 During the first two decades of his career, he attempted no political or social statements in his work. Today, however, with his children grown, Post has become interested in the narrative aspects of his work. Able to travel, he ranges the land of his memories, following back roads into rural pockets in the West where ranching continues as it once was. The life of the contemporary cowboy that Post emphasizes in bronzes such as Horse Feed is spiritually tied to the past by the sweat of the brow. Solid and strong, Horse Feed is rooted (as is Post himself) in family duty and love. Post muses that perhaps his interest in storytelling is a sign of growing older. Rightly so. His strong personal style is a direct reflection of his personality and maturity. With his technical skills finely honed, the added dimension of narrative allows him to make what he calls "simple statements' about how it feels to work in the real West, not the mythic West. It is a life absent of game playing and romanticism. No mechanical-bullriding in Pop culture bars, but home in bed early because at dawn the cattle will be loaded for market. Under the sky, I have no doubt. It is fitting that Post is showing his work at the Desert Caballeros Western Museum, AZ, which contains works by artists the likes of Charlie Russell, Thomas Moran and George Phippen. These artists have given us lasting visual memories of life as they experienced it. Post similarly offers his experiences and feelings in paintings and sculptures that will outlast the fads of the art world. Howard Post's art will endure as does the wide blue western sky itself.